Figure | Graphene-aided chip-scale nonlinear resonator for precise optical frequency synthesis and control. Voltage control of precise optical frequencies in graphene-nitride chip-scale resonators has now been demonstrated. This opens the door to atomically-thin optoelectronic devices for frequency metrology, precision spectroscopy, ultrafast optics, and quantum information sciences. Highlighted by the 2005 Nobel Prize in Physics, laser-based optical synthesizers and standards provide impactful contributions to our society, including high precision optical clocks with instability of 1 part in 1016, frequency standards such as the definition of one meter, and high-rate long-distance optical communications. They are often based on nonlinear oscillators with a precise and discrete set of frequency lines in a comb-like spacing, or termed a frequency comb. These nonlinear oscillations are achieved in state-of-the-art mode-locked femtosecond fiber lasers and more recently in chip-scale semiconductor resonators of sub-millimeter dimensions. Once manufactured, however, these nonlinear oscillators are often not tunable, requiring complex architectures for feedback or frequency locking. Writing in Nature, the Wong group at UCLA has now achieved voltage control of the nonlinear frequency comb oscillators and its respective optical frequencies for the first time. An example of the semiconductor chip is illustrated. The tunability is achieved with an atomic layer of graphene – a monolayer of carbon atoms – wherein its electron population and plasma frequency is directly tuned by the external voltage. This variable electron population and plasma frequency subsequently controls the refractive index and path length of the resonator, allowing the optical frequencies to be directly controlled. “This interdisciplinary study combines precision laser engineering with atomic-scale semiconductor physics to control nonlinear frequency oscillators”, notes the lead author, Dr. Baicheng Yao, now an assistant professor at the University of Electronic Science and Technology of China. “Oscillators play an essential role in many electronic and optical systems from selecting a radio channel to accessing precision timing for the global positioning system. Professor Wong exploits the interaction of nonlinear optical effects with the quantum behavior of electronic material to produce ultra-high frequency combs for precise measurement of molecular or other spectra. As a further application, varying detuning parameters, the path to the frequency comb passes through a chaotic state that provides a mask for sending secure encoded signals. Professor Wong’s work advances the exploration of novel complex nonlinear physics at the microscale of a computer chip”, notes Dr. Michael Shlesinger, a Program Officer at the Office of Naval Research. 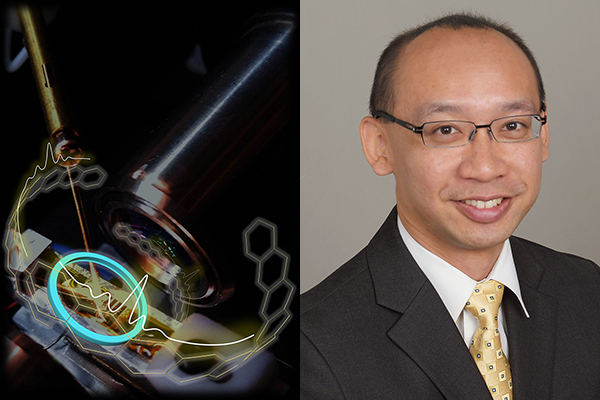 “Working with the Institute of Microelectronics in Singapore and the UCLA departments of Chemistry and Biochemistry, and Materials Science and Engineering, we were able to achieve an optically transparent tuning of the nonlinear frequency comb oscillators”, says Prof. Chee Wei Wong, enabling voltage-tunable terahertz-spacing oscillators and controllable ultrafast solitary pulses with periodic structure. These frequency oscillators also enable the detection and identification of trace molecules. The atomic monolayer to optical frequency control provides a new platform at the interface of nanoscale ultrafast optoelectronics and precision measurements. This work is examined in collaboration with the University of Electronic Science and Technology of China, the Institute of Microelectronics in Singapore, the departments of Chemistry and Biochemistry, and Materials Science and Engineering of UCLA, and the Shanghai Institute of Microsystem and Information Technology of China.